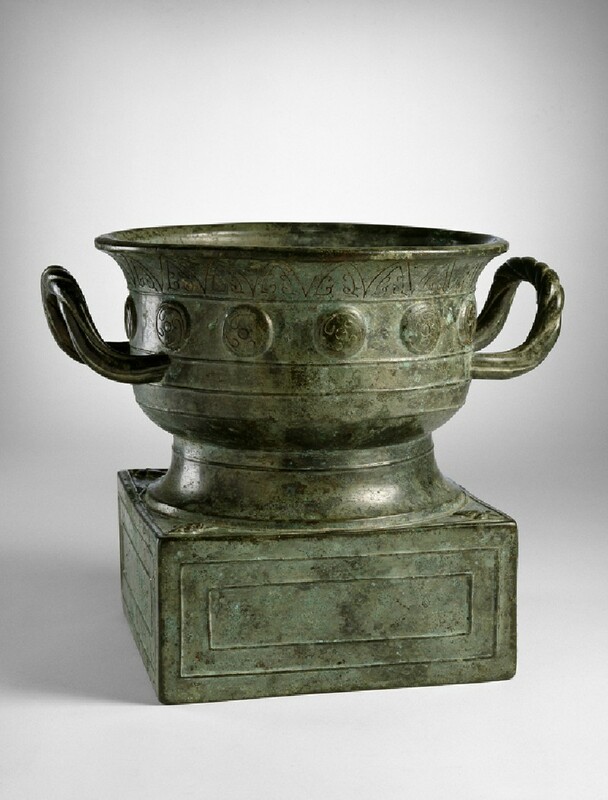 During the Western Zhou period (c. 1050 - 771 BC) bronze vessels were used in rituals to honour ancestors but also, by means of inscriptions, to commemorate military or political success. These bronzes are therefore historical documents in their own right, and the history and ownership of individual vessels can be traced through reproductions of the inscription. Rubbings of bronze inscriptions were gathered and published from the 11th century AD onwards, often accompanied by line drawings or rubbings of the complete vessel. This gui takes the form of a deep bowl with handles and was one of the principal ritual bronze vessel types of the Western Zhou period. Important examples were mounted on a square pedestal base and in the early Western Zhou, a small bell was typically suspended within the base. A suspension loop, though no bell, remains within the base of this vessel. A six-character inscription on the interior of this gui associates it with the state of Yong, whose territory was given to a sibling of the Western Zhou king, and is now part of the Henan province in north China. The gui’s recent history is equally distinguished; it was previously in the collections of Pu Lun, one of the princes of the Manchu imperial family, and of the eminent Qing dynasty (1645-1911) official and antiquarian, Duan Fang. Purchased with the assistance of the Art Fund, the MLA/V&A Purchase Grant Fund and the Friends of the Ashmolean Museum, 1996. A Chinese ritual food vessel with a deep bowl on a foot ring and handles.